Welcome to the new semester! Also, consider visiting your campus ahead of time to get comfortable with your parking and classroom locations before classes start if this will be your first semester with the college. Download the CPCC app to see all CPCC campus maps – or go directly to the Central Campus map for more specific information – and follow #cpccparking on Twitter. 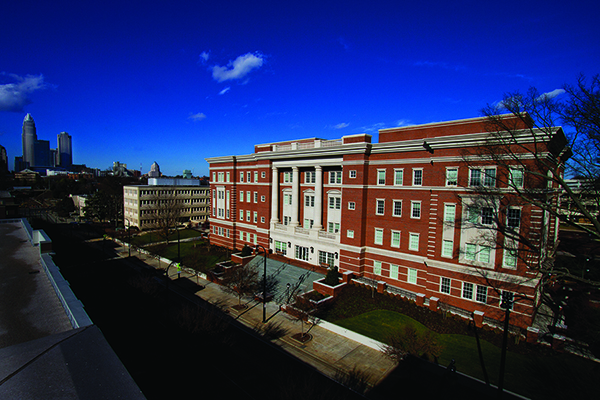 Central Campus parking deck #2 – 1108 Charlottetowne Ave.
Central Campus parking deck #3 – 1345 E. 4th St.
Central Campus parking deck #4 – 1225 E. 4th St. PARKING DECK CLOSURE: As a reminder, the parking deck located at the corner of 7th Street and Charlottetowne Ave. (parking deck #1), will remain closed until further notice while maintenance work continues. PARKING DECK / LOT AVAILABILITY: To help with the need for parking spaces on Central Campus, students can park in any of the other decks and in all surface lots. The only exceptions are spaces that require a handicap permit, visitor spaces, and designated maintenance vehicle or administration spaces. Also, students may not park in the SunTrust bank lot or risk having your car towed. Get your parking decal. Local businesses strictly enforce towing. Student parking decals are available at any campus Cashiering office during regular operating hours. All Cashiering offices will have extended hours the first two weeks of the term (Jan. 14–24). During that time, the hours of operation are 8 a.m. – 6 p.m. Monday through Thursday, and 8 a.m. – 5 p.m. on Friday. Parking decals must be displayed by Thursday, Jan. 31. If you have any questions, please contact the CPCC Information Center at 704.330.2722 (CPCC). Please consider carpooling or using public transportation, and plan to arrive early to campus to allow enough time to park and find your class. Traffic is heavy during this time of the year, and there are construction and maintenance projects on most CPCC campuses – particularly Central Campus – that could cause issues. We strongly encourage you to carpool or use public transportation as Central Campus traffic volumes adjust during the first two weeks of class. Also, consider visiting your campus ahead of time to get comfortable with your parking and classroom locations before classes start if this will be your first semester with the college. o Closed until 2019: Central Campus parking deck #1 – 1321 Charlottetowne Ave.
o Central Campus parking deck #2 – 1108 Charlottetowne Ave.
o Central Campus parking deck #3 – 1345 E. 4th St.
o Central Campus parking deck #4 – 1225 E. 4th St. PARKING DECK CLOSURE: As a reminder, the parking deck located at the corner of 7th Street and Charlottetowne Ave. (now called parking deck #1), will remain closed until further notice while maintenance work continues. PARKING DECK / LOT AVAILABILITY: To help with the need for parking spaces on Central Campus, students can park in any of the other decks and in all surface lots. The only exceptions are spaces that require a handicap permit, visitor spaces, and designated maintenance vehicle or administration spaces. Get your parking decal. Local businesses strictly enforce towing. Student parking decals are available at any campus Cashiering office during regular operating hours. All Cashiering offices will have extended hours the first two weeks of the term (Aug. 13-24). During that time, the hours of operation are 8 a.m. – 6 p.m. Monday through Thursday, and 8 a.m. – 5 p.m. on Friday. Parking decals must be displayed by Friday, Aug. 31. Central Campus Student Parking Deck 1, located at the corner of Charlottetowne Avenue and 7th Street, will remain closed for ongoing repairs throughout the fall semester. To help with the need for parking spaces on Central Campus, students can park in any of the other decks and in all surface lots. The only exceptions are spaces that require a handicap permit and visitor spaces. Students should avoid parking on side streets around campus. At the same time, students who drive to campus should arrive well in advance of their first class to given themselves plenty of time to find a parking space. Students who can carpool or use public transportation are encouraged to do so. The parking lot attached to the SunTrust building between 3rd and 4th Streets at Kings Drive is reserved for patrons and employees of the businesses housed in that building. CPCC students are asked to refrain from parking in this lot, and instead, park in any of the CPCC lots or decks located on Central Campus. View parking locations. You may contact CPCC Parking Services or Central Campus Administration with any questions you may have. Thank you. Welcome to the 2018 Spring Semester! Thank you for using your CPCC e-mail account; it is the official means of college e-mail communication to you so please check your account often. As we gear up for the spring 2018 semester – classes begin this Thursday, Jan. 11 – we want to share some important reminders to help you during the first week of class. Remember, CPCC is a tobacco-free college. All tobacco products (including anything resembling tobacco products, such as e-cigarettes) are not allowed anywhere at all times. Thanks for your cooperation. Please note there are many construction projects going on around CPCC’s campuses so please follow all construction signs: Be alert and watch out around you. Consider taking out ear buds and taking off headphones while on campus walkways and when crossing the street. 1. Attend class on the first day. Download the CPCC app and use your CPCC login to view your class schedule from My College (or go to My College to print your schedule). Bring a copy of your class schedule to ensure that the location has not changed. Pay attention to both the campus and building name for your classes. Look for information tables on campus to help you locate your classrooms or answer questions. PLEASE NOTE: Wednesday Jan, 17 is the last day to add a full semester class without permission. Another twelve-week session begins February 12 and the second eight-week short session begins March 19. Check CPCC Schedule Builder for course availability. 2. Plan to arrive early to allow enough time to park and find your class. · PARKING DECK CLOSURE: Student Parking Deck 3, located at the corner of 7th Street and Charlottetowne Ave., will remain closed until further notice while maintenance work continues. Please use the Employee and Theater Deck on 4th Street (#22 on the map), Student Decks 1 and 2, and the available Central Campus surface lots. · PARKING DECK ACCESS: You can still enter and exit Student Parking Deck 1 on 4th St. however, due to construction, you cannot enter/exit the deck from Charlottetowne Ave.
· LANE OPENING: There’s good news, though: The one lane of Charlottetowne Avenue (between 4th St. and Elizabeth Ave.) that was closed for construction of the new Advanced Technology Center on Central Campus will reopen sometime in mid-January. 3. Park only in areas designated for CPCC students. Local businesses strictly enforce towing. Student parking decals are available at any campus Cashiering office during regular operating hours and in Central High room 263 from 10:30 a.m. – 3:30 p.m. Monday (1/8) through Friday (1/19) next week. Parking decals must be displayed by Wednesday, Jan. 31. 4. Use your CPCC Login to access My College. Access My College to find important information such as your class schedule, residency status, priority registration dates, enrollment verification, critical alert information, your student ID number and much more! 5. Pay your tuition by the due date to avoid being dropped from your classes. As of now, payment is due the day of registration. For payment information, visit CPCC Cashiering (http://www.cpcc.edu/cashiering/tuition-payment-dates). Log into My College (http://mycollege.cpcc.edu/) to view your spring 2018 tuition bill. 6. Get your student ID. CPCC Today is your student e-newsletter sent to your CPCC email every Wednesday or read it via the CPCC app. CPCC Today covers a wide range of useful information from registration, parking and payment to important dates and events. 8. Learn about refund delivery options if you receive financial aid. Refunds are processed electronically at CPCC! If you’re a new curriculum student registered for spring 2018 who receives financial aid, approximately two weeks after the semester begins, you will receive a bright green envelope from Bank Mobile. Inside your envelope will be an Instant Personal Code with instructions on choosing your refund delivery option. The personal code will be needed to choose your refund delivery option. Your refund delivery options are: an electronic deposit to a personal bank account or an electronic deposit to a Bank Mobile Vibe account. If your selection is an electronic deposit to BankMobile Vibe account, a CPCC BankMobile Debit Card will be mailed to you. Remember this is NOT a credit card but refund-only card. If you have not received your card, make sure you have updated your address through MyCollege. For more information, visit https://bankmobilevibe.com/. If you have any questions regarding the CPCC BankMobile debit card, please contact BankMobile at 1.866.782.0821 or the Cashiering office at 704.330.4472. We are here to help you and we are ready to help you reach your academic goals. If you have any questions, call the CPCC Information Center at 704.330.2722 or visit the Student Success Center at any campus. Please plan to arrive early during the first two weeks of class. Traffic is heavy during this time and there are construction and maintenance projects on Central Campus that could cause issues. We strongly encourage you to carpool or use public transportation as Central Campus traffic volumes adjust during the first two weeks of class. We apologize for the inconvenience and thank you for your patience! To alleviate traffic congestion on Central Campus while Student Deck 3 is closed for maintenance, the Employee/Theater Deck will be open to students. The Employee/Theater Deck is located on 4th Street between Student Deck 1 and the intersection with S. Kings Drive. The deck is on the right, just before the Overcash Building. The Employee/Theater Deck will remain open to students until further notice. The Merancas parking lot will have closed areas due to construction in the coming weeks. With this in mind, CPCC Facilities is asking students and staff to utilize the OVERFLOW Mecklenburg County parking area, located across the street at 12105 Verhoeff Dr. Please follow the OVERFLOW PARKING signs to locate the lot. 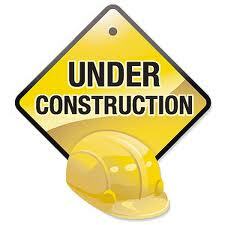 Construction is underway all around Merancas and the Huntersville Athletic Park area, students should use caution while walking and driving around the area. CPCC Facilities expects construction to be complete by September, giving the campus the capacity to accommodate parking for all students and staff. Please stay tuned for additional updates. Thank you for using your CPCC email account; it is the official means of college e-mail communication to you so please check your account often. As we gear up for the fall 2017 semester – classes begin Wednesday, August 16 – we want to share some important reminders to help you during the first week of class. Remember, CPCC is a tobacco-free college. All tobacco products (including anything resembling tobacco products, such as e-cigarettes) are not allowed anywhere at all times. Thanks for your cooperation. Download the CPCC app and use your CPCC login to view your class schedule from My College (or go to My College to print your schedule). Bring a copy of your class schedule to ensure that the location has not changed. Pay attention to both the campus and building name for your classes. Look for information tables on campus to help you locate your classrooms or answer questions. PLEASE NOTE: Friday (8/18) is the last day to add a full semester class without permission. Another twelve-week session begins September 11 and the second eight-week short session begins October 16. Check CPCC Schedule Builder for course availability. Traffic is heavy during the first two weeks of class. Download the CPCC app to see campus maps or visit www.cpcc.edu/campuses for information about each campus and tours, and follow #cpccparking on Twitter for the latest updates. LANE CLOSURE: One lane of Charlottetowne Avenue (between 4th Street & Elizabeth Avenue) is CLOSED for construction of the new Advanced Technology Center. Access into Student Parking Deck 1 is still OPEN. The exit from Student Parking Deck 1 onto Charlottetowne Avenue is CLOSED for construction. Exit onto 4th Street. We apologize for the inconvenience. Students are encouraged to use the higher capacity Student Parking Deck 3 at the corner of 7th St. and Charlottetowne Avenue. Local businesses strictly enforce towing. Student parking decals are available at any campus Cashiering office during regular operating hours and in Central High Room 263 from 10:30 a.m. – 3:30 p.m. Monday (8/14) through Friday (8/18) next week. Parking decals must be displayed by Wednesday, Sept. 6. As of now, payment is now due the day of registration. For payment information and due dates (is “due dates” needed? 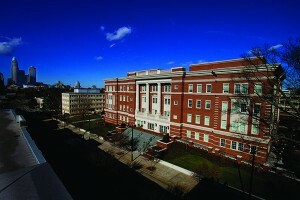 ), visit CPCC Cashiering (http://www.cpcc.edu/cashiering/tuition-payment-dates). Log into My College (http://mycollege.cpcc.edu/) to view your fall 2017 tuition bill. Refunds are processed electronically at CPCC! If you’re a new curriculum student registered for fall 2017 who receives financial aid, you will receive a bright green envelope from Bank Mobile. Inside your envelope will be an Instant Personal Code with instructions on choosing your refund delivery option. The personal code will be needed to choose your refund delivery option. Your refund delivery options are: an electronic deposit to a personal bank account or an electronic deposit to a Bank Mobile Vibe account. If your selection is an electronic deposit to BankMobile Vibe account, a CPCC BankMobile Debit Card will be mailed to you. Remember this is NOT a credit card but a refund only refund-only card. If you have not received your card, make sure you have updated your address through MyCollege. For more information, visit https://bankmobilevibe.com/. If you have any questions regarding the CPCC BankMobile debit card, please contact BankMobile at 1.866.782.0821 or the cashiering Cashiering office at 704.330.4472. We are here to help you, and we are ready to help you reach your academic goals. If you have any questions, call the CPCC Information Center at 704.330.2722 or visit the Student Success Center at any campus. Please be advised that on Thursday, March 2, 2017, levels 7 and 8 in Student Parking Deck #3 (located at the corner of Charlottetowne Ave. and East 7th St.) will be closed to all student, faculty and staff parking from 6 – 11 a.m. The space has been leased out to a CPCC approved vendor. As we gear up for the fall 2016 semester – classes begin Monday, August 15 – we want to share some important reminders to help you during the first week of class. Remember, CPCC is a tobacco-free college. All tobacco products (including anything resembling tobacco products, such as e-cigarettes) are not allowed anywhere at all times. Thank you for your cooperation. Download the CPCC app and use your CPCC login to view your class schedule from My College (or go to My College to print your schedule). Bring a copy of your class schedule to ensure that the location has not changed. Note both the campus and building name for your classes. Look for information tables on campus to help you locate your classrooms or answer questions. PLEASE NOTE: Tuesday (8/16) is the last day to add a full semester class without permission. A twelve-week session begins September 12 and the second eight-week short session begins October 12. Check CPCC Schedule Builder for course availability. Traffic is heavy during the first two weeks of class. Download the CPCC app to see campus maps or visit www.cpcc.edu/campuses for information about each campus and tours, and follow #cpccparking on Twitter for the latest updates. Local businesses strictly enforce towing. Student parking decals are available at any campus Cashiering office during regular operating hours and in Central High Room 263 from 10 a.m. – 4 p.m. Monday through Friday during the first week of school. Parking decals must be displayed by Friday, September 16. As of now, payment is now due the day of registration. For payment information and due dates, visit CPCC Cashiering (http://www.cpcc.edu/cashiering/tuition-payment-dates). Log into My College (http://mycollege.cpcc.edu/) to view your fall 2016 tuition bill. Refunds are processed electronically at CPCC! If you’re a new curriculum student registered for fall 2016 who receives financial aid, you will receive a bright green envelope from Bank Mobile. Inside your envelope will be an Instant Personal Code with instructions on choosing your refund delivery option. The personal code will be needed to choose your refund delivery option. Your refund delivery options are: an electronic deposit to a personal bank account or an electronic deposit to a Bank Mobile Vibe account. If your selection is an electronic deposit to BankMobile Vibe account, a CPCC BankMobile Debit Card will be mailed to you. Remember this is NOT a credit card but a refund only card. If you have not received your card, make sure you have updated your address through MyCollege. For more information, visit https://bankmobilevibe.com/. If you have any questions regarding the CPCC BankMobile debit card, please contact BankMobile at 1.866.782.0821 or the cashiering office at 704.330.4472. We are here to assist you and are ready to help you reach your academic goals. If you have any questions, call the CPCC Information Center at 704.330.2722 or visit the Student Success Center at any campus. Welcome to the Spring 2016 Semester! As we gear up for the spring 2016 semester – classes begin Monday, January 11 – we want to share some important reminders to help you during the first week of class. Remember, CPCC is a tobacco-free college. All tobacco products, including vapes and other e-cigarette devices, are prohibited everywhere at all times. We thank you for your cooperation. 1. Attend class on the first day. Download the new CPCC app and use your CPCC Login to view your class schedule from MyCollege (or go to http://mycollege.cpcc.eduto print your schedule). Bring a copy of your class schedule to ensure that the location has not changed. Note both the campus and building name for your classes. Look for information tables on campus to help you locate your classrooms or answer questions. 2. Plan to arrive early to allow enough time to park and find your class. Traffic is heavy during the first two weeks of class. Download the new CPCC app to see campus maps or visit http://www.cpcc.edu/campuses for information about each campus and follow #cpccparking on Twitter for the latest updates. Be aware of the new CATS CityLYNX Gold Line streetcar/trolley that’s now running up and down Elizabeth Avenue. 3. Park only in areas designated for CPCC students. Local businesses strictly enforce towing. Student parking decals are available at any campus Cashiering office during regular operating hours and in Central High Room 122 from 10 a.m. – 4 p.m. Monday through Friday during the first two weeks of school. Parking decals must be displayed by February 5. 4. Use your CPCC Login to access My College (or go to http://mycollege.cpcc.edu/) to find important information such as residency status, priority registration dates, enrollment verification, critical alert information, your student ID number and much more! 5. Pay your tuition by the due date to avoid being dropped from your classes. As of now, payment is now due the day of registration. For payment information and due dates visit CPCC Cashiering (http://www.cpcc.edu/cashiering/tuition-payment-dates). Log into My College (http://mycollege.cpcc.edu/) to view your spring 2016 tuition bill. 7. Read CPCC Today, your student e-newsletter sent to your CPCC email every Wednesdayor read it via the new CPCC app an. CPCC Today (http://www.cpcc.edu/cpcc-today) covers a wide range of useful information from registration, parking and payment to important dates and events. 8. Have you received your CPCC Debit Card? If you’re a new curriculum student registered for spring 2016 who receives financial aid, you will receive a CPCC Debit Card. Remember this is NOT a credit card but a refund only card. Once you receive your card, follow the included instructions and select your refund choice. Keep your card in a safe place even if you do not expect a refund this semester, as there is a replacement card fee. The CityLYNX Gold Line is Here! Watch the Safety Podcast to Earn a Free T-Shirt! 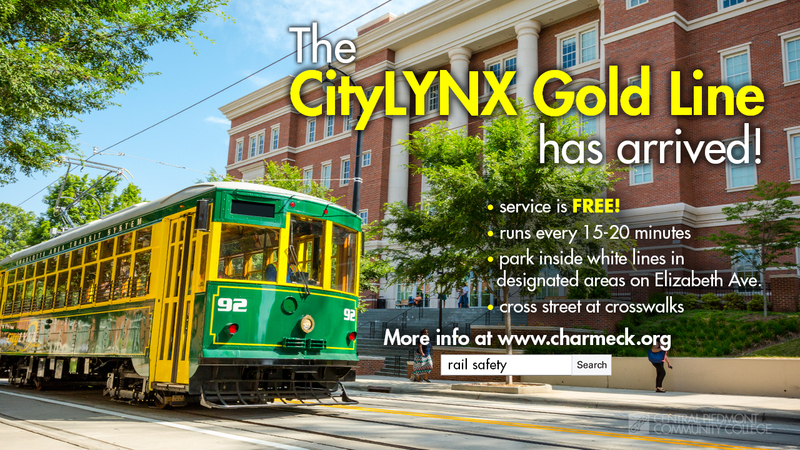 The CityLYNX Gold Line, Charlotte’s new rail service (trolley car) is now servicing CPCC’s Central Campus! The Gold Line is a free service; therefore, students do not need a ticket to ride. It runs every 15 to 20 minutes from Time Warner Cable Arena to Novant Presbyterian Medical Center, along Elizabeth Avenue. Monday – Thursday: 6 a.m. to 11 p.m.
Sunday: 9 a.m. – 7 p.m.
• Park only in designated spaces. Even if just for a few minutes, do not park your car on Elizabeth Avenue if there is not an official parking space. • Your entire vehicle, including mirrors, must be within the solid white parking lines. Incorrectly parked cars will be subject to a citation and towing. • Cyclists should cross the tracks at a 90 degree angle to avoid getting wheels stuck or crashing. • Cross only at designated crosswalks. • Do not cross in front of a streetcar. Even if the streetcar is stopped. Wait for the streetcar to pass before you cross. • Watch your heels. Step over the tracks to avoid catching your shoe in the track gap. Finding a spot to park on campus can sometimes be an issue, and finding someone else parked in a spot not designated for their vehicle only adds to the frustration. To solve this issue, CPCC has increased its parking fine to $15 per violation. The fine increase will discourage individuals from parking illegally or in spaces where they do not have the proper authorization. To avoid getting a ticket, make sure you follow the campus’ parking rules and obtain an official CPCC parking permit from the Cashiering Office, located on any CPCC Campus.